Jeju Pool. Jeju, South Korea. Installing July 2018 40 Interactive glass and steel platform spanning 50 feet in diameter. Image Courtesy of Jen Lewin. In today’s fast-paced world where changes in technology lead to changes in everything we do and use, it might surprise you that public artists and fabricators prefer to use tried-and-true materials in their new works. Structural glass is a common commercial material used to create glass decks, walkable skylights, and glass stairs, just to name a few. One of the most iconic uses of structural glass in architecture might be the Apple Store Cube in New York City, which is currently being renovated. 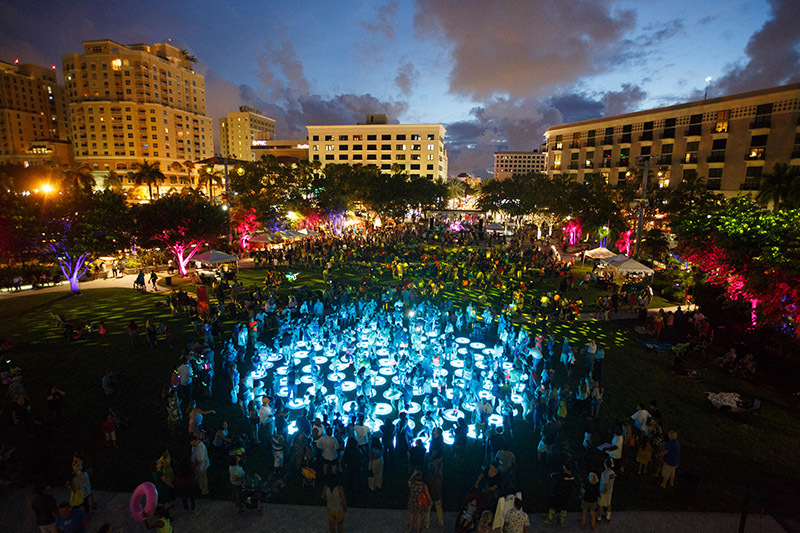 Interactive artist Jen Lewin, known for her iconic temporary installation, The Pool, is now using this existing material to create playful permanent public art experiences that are set flush into the ground. Promenade (2018, Denver Colorado) and Ascent (2018, Coral Springs Florida), with a third in the works for Jeju, South Korea, provide an artistic element in a public space without losing square footage. Promenade by Jen Lewin, Jen Lewin Studio 2018. Located in the Black Street Passage, as part of the Dairy Block, Denver Colorado. 16 interactive glass platforms spanning 40 feet. Completed Feb 2018. http://jenlewinstudio.com/promenade/ Image Courtesy of Jen Lewin. Utilizing sacred geometry and the installation location as inspiration, Lewin's installations interact with individuals as they walk, jump, and play over an installation mimicking their movements with color and light. Lewin isn’t a glass artist: she leaves the material fabrication up to the experts, specifically Wayne Conklin of Glass Flooring Systems. Once her preliminary designs were approved by the commissioning bodies, Lewin went to Conklin prepared with her own drawings, both artistic renderings and architectural plans. 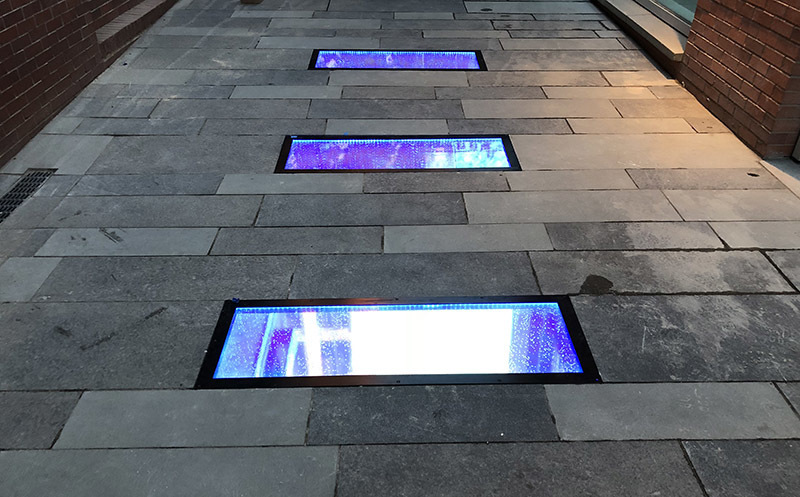 Glass Flooring Systems then produced their own set of drawings to validate the type of glass, glass makeup, number of layers, size and finishing texture. The fabricator and artist then rely on a third party engineer to validate the design and material for the public space. “The rule of thumb for any commercial flooring is 100 pounds per square foot live load”, confirms Conklin, “regardless of material.” To achieve this standard, Glass Flooring Systems provided Lewin two different kinds of safety glass, tempered and laminated, combined together. The combination provides both strength and resistance to impact that would be required for heavy traffic. “Glass independently will last forever. I’ve seen windows from a couple hundred years ago.” Conklin also adds that care and maintenance are minimal. “Just like a window in your house or your car,” these interactive public sculptures just need to be cleaned every now and again. While a properly fabricated and installed material should remain in one piece as long as the weight limit isn’t exceeded, it is still glass. To mitigate this potential risk and to simplify any repairs to either the glass or her internal electronics, Lewin designs her larger installations, like Ascent, in pieces so they are easy to replace in case of an emergency. Alternatives to the structural glass for Lewin include acrylic, which she has avoided to keep maintenance to a minimum. It would need to be resurfaced annually to maintain the effect of dancing on light. However, Lewin and her team apply a layer of dichroic film onto acrylic sheets cut to match the glass pieces. This colorful and reflective layer is placed beneath the glass and provides a surface shifting in color based on the viewer’s point of view that will softly reflect the environment without impeding the lighting effects at night. Image courtesy of Kyle Miller. The word stucco might conjure up visions of residential houses and it is most commonly used for siding, but artist Rachel Timmins worked with fabricators Kyle Miller and Tim Scofield to use stucco and other recycled materials on larger than life sculpture in Southeast Baltimore. 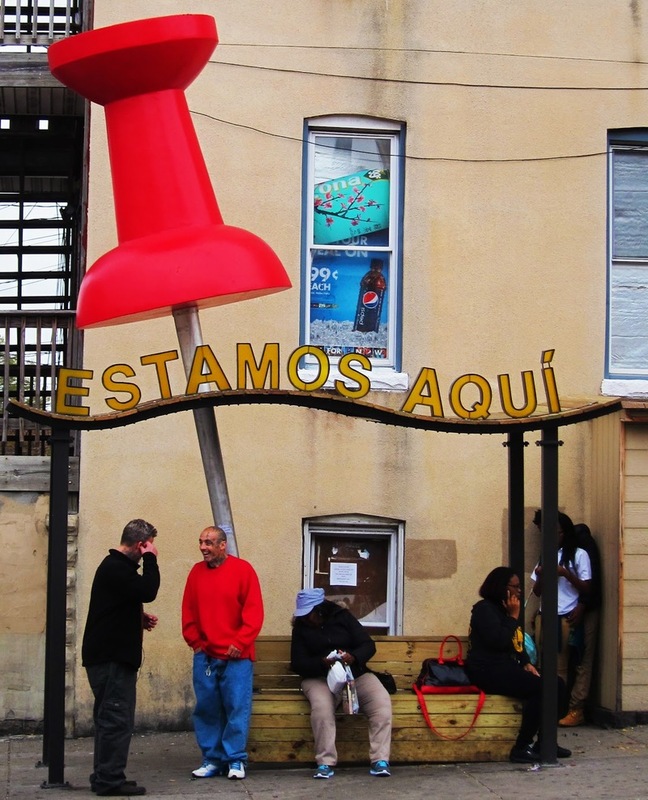 The sculpture, in the Baltimore Highlands neighborhood, is a bus shelter that features a giant red pushpin puncturing the shelter's roof, over which "Estamos Aqui" (“We Are Here” in Spanish) is adorned. At roughly 17 feet tall and 12 feet wide it is made from a variety of materials including foam, wood, aluminum, steel, acrylic and a synthetic stucco. The more complicated part of the sculpture was the top to the pushpin. 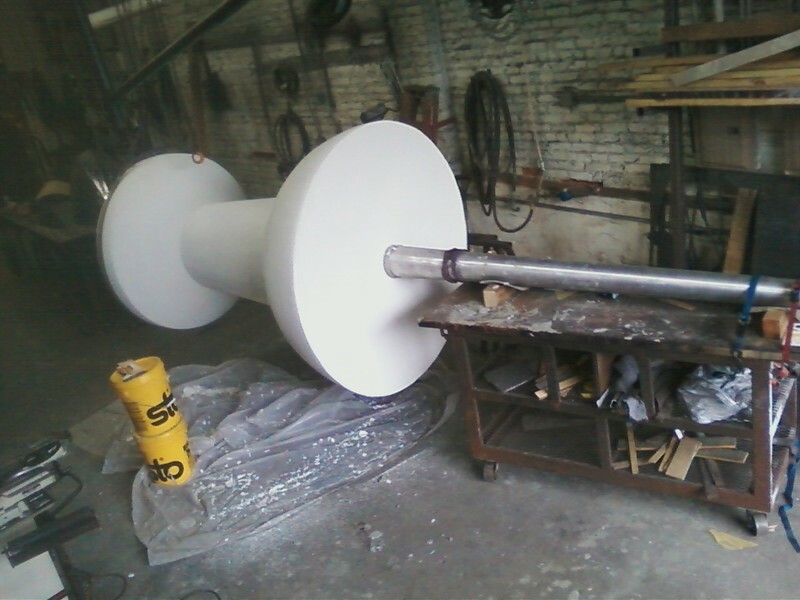 Looking for a sturdy material that delivers a smooth finish like a classic plastic push pin, fabricator Kyle Miller says they originally started thinking about fiberglass, “We went back and forth on materials, throwing everything we could think of at it. Fiberglass was what we stuck on at first, but it comes with its’ own set of problems.” Miller and Scofield reached out to a friend in a different field, a prop master for film and stage, who suggested a material he used regularly, stucco. The material, a synthetic stucco from Sto Corporation, was readily available and traditionally used for exterior architectural applications which made it viable for use in public art. They started by carving the shape of the pin in three pieces out of polystyrene. Once the pieces were glued together, they coated the form with the stucco and fiberglass strips and finished it by sanding the final layer smooth. They finished the primer colored pin with a bright red latex paint, the highest quality exterior Sherwin Williams offers. As the materials used are designed to be used in a range of exterior applications, the lifespan is long and the upkeep minimal. Stucco can crack or dent but usually only if it is kicked or bumped. Since the piece is up off the ground and out of reach, Miller says he isn’t worried about that but repairs are simple and can be done on site. The paint should be touched up every 5 - 7 years and today (at the three-year mark) it shows little age. Make sure to check out these public art installations that wowed in 2017! Julie Miller is a rebel with a passion for supporting creative and artistic professionals. 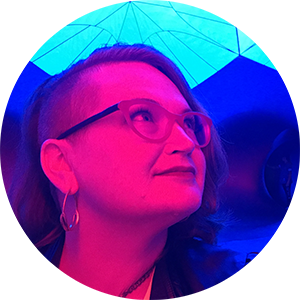 She has an extensive background working in creative industries from film to public art.The more time she puts into helping you, the more time you can spend doing what you do best. Art school may be in the past, but don’t you wish you still had a teacher on standby to give critiques? We found 4 other ways to get the feedback your art needs. Advice from ten artists who have done it—and now sharing their biggest secrets to success. Don't miss out on any of these common tax deductions you can claim as an independent artist.